Shoe Troubles | Barbie Who? A few weeks back, I purchased some Barbie shoes as a finishing detail for the dolls I’m doing for Barbie Who? They came in a variety of colors and styles to match whatever look I’m going for. 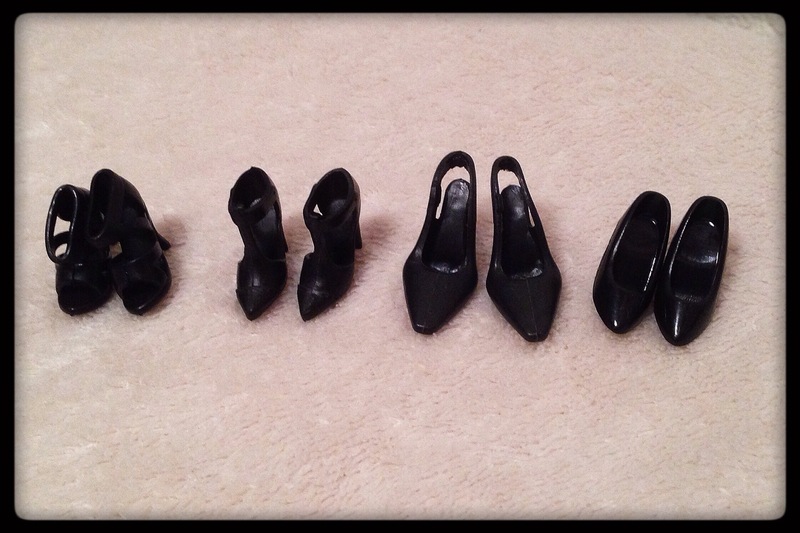 I went ahead and picked out all of the black shoes to help me decide which one to use for Cofelia’s outfit. Four pairs of heels were black, and two matched the closed-toe style seen in the episode. The two that went up the ankles were immediately eliminated, leaving me with a pair of dainty pumps and a pair of sling-backs. I decided the pumps would best for the aesthetic I’m going for. I picked them up and tried to put them on the Cofelia doll. Then the problem became apparent. The shoes do not fit onto the doll I planned on using for Cofelia. The doll has flat feet with painted nails. I think they look very pretty, but they don’t fit into the curvature of the shoe. They’re also much too big. None of the black heels will fit her, and that is a pretty big problem. This puts me in an awful situation. I either have to buy a pair of shoes that will fit, make a pair of shoes for her to wear, or find a new doll that can fit into the shoes. This will be difficult no matter which way I go…. I’m going to look at my options and continue forward. My next goal is to make the stockings. I just purchased the stabilizing paper needed for it, and I have a pair of stockings I’m willing to sacrifice. Hopefully they won’t be problematic…. Oh I so know how you f eel. I have several different types of Barbie and a lot of them take different sized shoes. The vintage Barbie shoes are quite dainty and the Fashion Fever girls can wear them but the Model Muse bodied dolls with the hard legs can’t. I’ve had to chase up extra shoes just for them. I have stayed away from the Stardoll Barbies so far because I know their feet are different as are some of the beach Barbies made a few years ago. If you come across any cheap ones Cofelia might be able to wear Stardoll Barbie shoes or shoes made for Fashion Royalty dolls. As she will be wearing stockings she might need a slightly larger shoe anyway. Older Barbies with poseable bodies like the gym Barbies often had flat feet but they only came with flat gym shoes. However black “sensible shoes” might work for a Nanny. LMK how you get on. Thank you so much! Working with Barbie dolls has quite the learning curve, and I’m still trying to learn all of the different bodies and the nuances has been quite rewarding, and the wealth of knowledge you and other more experienced people have has been a gigantic help. Thank you so much for the ideas! I’ll see what I can come up with now that I know what to search for. That’s OK, I could not remember if you had said what sort of doll Cofelia is. If she is one of those California Girl beach Barbies they never came with shoes so that will be tough. Her feet do look large and you may end up having to make some because although there are lots of custom shoes out there they are not cheap. I never have looked into which doll Cofelia is. I will take some time to do that tonight. I found a pattern for ballet flats, but they turned out too small. I am going to make another pair that is longer to see if they will work. While the look isnt quite what I had in mind when looking closely, but from a bit more of a distance they look nice. I have seen the price of custom shoes and it is crazy! I am determined to make something functional, even if it isn’t what I initially envisioned. Good luck, show us the pictures of what you make. The other alternative to making shoes or getting a new doll might be to give Cofelia a body transplant. A bit drastic I know. That certainly is an option, but I’m not sure I trust myself not to break something if I tried transplanting heads. I think I would mold some clay dorectly onto her feet before doing that because of my trepidation. Head transplants are scary. I’ve done it once or twice. There are some good instructions on various doll blogs of how to do it safely but you’d be best to find out who Cofelia is first as neck knobs vary nearly as much as feet.